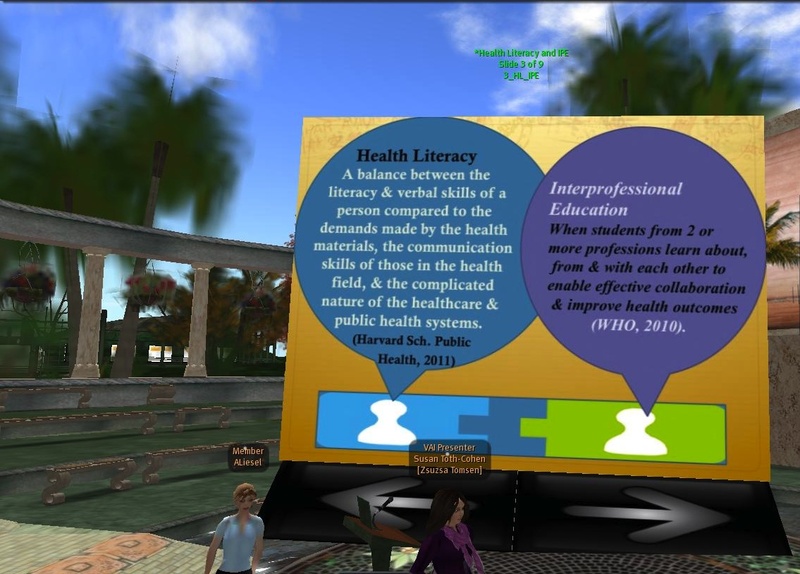 On Sunday November 4, Gentle Heron at Virtual Ability Island hosted a discussion on "Health Literacy." "I see some in the audience are health care educators," she told everyone after greeting them, "I suspect others of us will find useful information here for our own areas of work." Zsuzsa Tomsen and ALiesel were the presenters of the discussion. 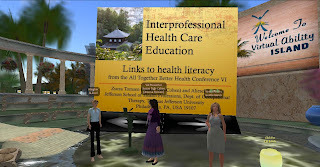 Susan Toth-Cohen in real life, Zsuzsa "is the Director of the Occupational Therapy Doctoral Program and Professor at Thomas Jefferson University in Philadelphia, PA," Gentle told everyone, "She has extensive experience teaching and presenting in SL. She is an occupational therapist specializing in gerontology and consumer health. 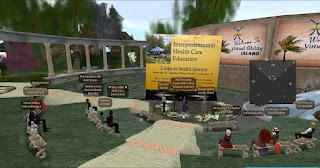 ALiesel is an occupational therapy graduate student at Thomas Jefferson University in Philadelphia, She works with Zsuzsa in the Garden of Healthy Aging here in Second Life, and is very interested in health literacy." The discussion was in text, with the audience asked to introduce themselves first. Among them was a "doctoral student," "a pediatrician, the department head of University of the Incarnate Word in San Antonio, Texas, and a vocational rehabilitation worker. Zsuzsa and ALiesel had attended a health conference in Kobe Japan, "The conference … made us think about links between introprofessional teams and health literacy." He noted the conference had three main details" global perspectives, development of "interprofessional" education, and examination of results. 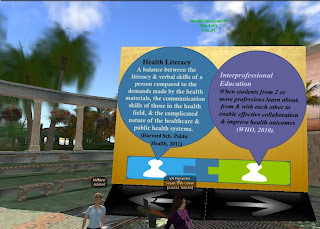 Of health literacy, Zsuzsa described the definition by the Harvard School of Public Health, "the balance between literacy and verbal skills of a person compared to demands of the health materials, communication skills of health professionals and the health care system." "Interprofessional education which I'll refer to as IPE," Zsuzsa went on, "is defined by the World Health Organization as being any time students from 2 or more professions learn about, with, and from each other with the goals of effective communication and improving health outcomes." A screen behind them showed several illustrations as Zsuzsa talked, showing a few links. She talked about how, "IPE also makes health care safer by decreasing medical errors" and health mentors. She described the University of British Columbia as a leader in IPE, "they've developed a fantastic interprofessional education series." ALiesel mentioned one project the Thomas Jefferson University started, "Since 2005, Jefferson has sent several IP teams of students to Rwanda. They have worked with Rwandan health care teams to train health professionals" in addition to working with them "to provide training in nutrition, hygiene, HIV/AIDS prevention, as well as providing education for the public through health fairs and other events." There was some talk with the audience, one stating, " 'Nearly half of all American adults – 90 million people – have difficulty understanding and using health information, and there is a higher rate of hospitalization and use of emergency services among patients with limited health literacy,' the Institute of Medicine 2004." Near the end, Rachel Gloedu brought up, "We are inviting volunteers from the SL community to observe and evaluate medical and nursing students undergoing teamwork training in communication skills this month." At the close, Gentle Heron, gave all her thanks, "Thank you all for coming today. And special thanks to Zsuzsa and ALiesel for sharing a few of the things they learned on their trip to Japan." "We enjoyed it so much!" Zsuzsa responded, "Great audience!" The Second Life Enquirer recently wrote on Virtual Ability Island: article here.